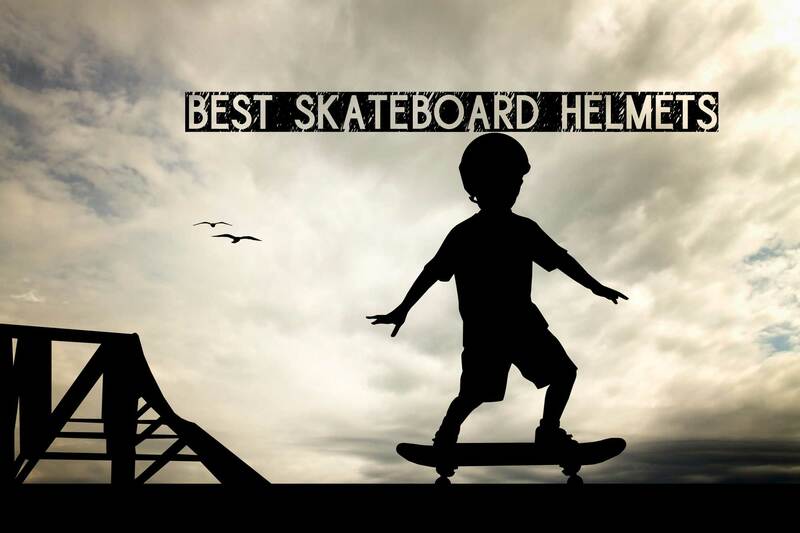 7 Best Skateboarding Helmets For Safety in 2019 with Buying Guide! Top Skateboard Helmets in 2017! You’ve just got yourself an awesome skateboard, it has the coolest graphics, colors and effects, you’ve shown it off to your friends, now it’s time to think of safety, by which, of course we mean a skateboarder’s helmet. It’s often said that ‘information is power”, this is true. Skateboarding can be tough on the human body, safety and protection is paramount, this is why, before buying a helmet, you need to know what is out there and why one is safer and better for you than the other, there are a few factors to consider when selecting the best skateboard helmet. You may have noticed that they come in so many forms and for different uses: while some are for bicycles, some are for snowboarding. You may also have noticed the many price ranges in which they are sold and the different qualities available. Perhaps you want to know if any cheap one is good enough or if this is something you need to see as a small investment? First of all, safety is of the highest priority, but you also want a great looking helmet, designed for skateboarders that matches the style of their skateboard decks, at a reasonable price that offers great features and benefits. The only way to find out is through research, which I have done for you, so you don’t end up making a bad buying decision. Where safety is concerned, a bad buying decision might just be the difference between life and death. This is the ultimate determinant of how long your helmet is going to last and how much protection it provides. The better brands cost more because of the research and technology that goes into making them, they also make the effort to be certified by the necessary authorities as meeting the regulations required for helmets. -Inner Lining: The certifying bodies (ASTM and CPSC) require helmets be lined with EPS. Soft padding: foam padding is usually softer and more comfortable than EPS foam (Expandable Polystyrene Styrofoam), however, EPS foam absorbs impact better. -Outer Body: The outer shell can be made up of ABS plastic (Acrylonitrile Butadiene Styrene). In some cases, especially with high end brands, the helmet can be made of a combination of ABS with EPS Foam, it makes for a lightweight but solid helmet. There are also other options like high-density, injection-molded PE (a strong, durable and lightweight helmet material, also used for hockey). What is a reasonably priced helmet ? You might as well ask “how long is a piece of thread”? Both questions are vague and very dependent on personal choice. Everyone has a different idea of what is reasonable. On Amazon, the cheapest helmet costs around $15( a brand called Paymenow) and the most expensive costs $325 (Sector 9 DH6 Downhill Adult Skateboard Helmet). Just because a helmet is very expensive doesn’t always mean it is safer or provides better protection. Sometimes, the price charged is just all about the branding and customer perception. A badly fitted helmet is just as bad as not wearing any. If your helmet is too loose and you happen to crash, your helmet will probably have enough time to fly off your head before the blow to your head occurs. At the same time, if it is too tight, then you are more likely to not wear it due to discomfort. This is why I am providing you with measuring guidelines. Taking your head measurements is a very easy process, all you need is a soft tape measure and this small piece of instruction to follow. Take the soft tape measure and wrap it around your forehead. It should rest just over your ears and eyebrows, exactly as your helmet should. Keep the measure level from the front to back of your head, making sure it’s not too tight or too loose. If struggling to take measurements easily, use a mirror or have a friend help you. If you can’t find a tape measure, repeat the initial instructions using a string. Once you have it wrapped properly around your head, mark it and measure it against a ruler. Record the measurements in inches for US and UK , centimeters for European measurements. If for some reason you can’t measure your head, check the sizing on a well-fitting hat you own, it will give you a rough estimate of the correct helmet size. Every brand of helmet uses a different chart, always compare your personal measurements to their chart. All helmets should be CPSC (Consumer Product Safety Commission) certified to be sold in the US market. 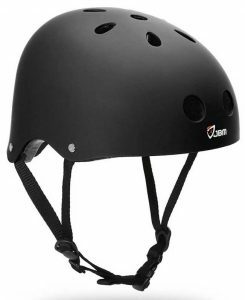 This is a minimum requirement and it is best suited for bicycle helmets, however, the best skate helmet should be certified by the ASTM (American Society for Testing Materials). Good skateboarding helmets should distinctly have an ASTM F1492 sticker, this is because the ASTM skateboard standard requires a multi-impact helmet. The ASTM regulation is the only guarantee that you have a helmet designed for you as a skateboarder due to more rigorous, more extensive tests carried out on the helmets. After going through a few important things to consider before buying a skateboarding helmet , there are 7 skateboarding helmets worth mentioning. These skate helmets are not the most expensive brands in the market, but based on many customer’s reviews, these helmets are the most worthy of their price tags as a result of the benefits they provide the wearer. Triple 8 Dual Certified Helmet. This is a set that comes in many various colors, 12 of them, to be exact. It would be unusual to not be pleased by at least one. Lined with EPS foam, it provides optimum protection to the head. -It is illegal to wear non certified helmets in a skate park or while cycling on the streets. When you wear a Triple Eight Dual Certified Helmet, you do not have to worry about being stopped by officers of the law or about where you are allowed to skate because the helmet complies with all the necessary US regulations, and then some . 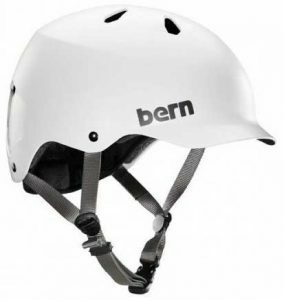 It complies with CPSC Safety Standard for Bicycle Helmets, ASTM F-1492-08 Safety Standards, CE EN 1078 – Helmets for pedal cyclists, skateboarders and roller skaters and AS/NZS 2063 – Bicycle Helmets. A small percentage (2%) of Amazon customers have found the fitting to be a bit off. Some customers have complained that the helmet is difficult to adjust because the helmets lack a crank dial which many other top helmets have. This helmet is only adjustable by straps alone. 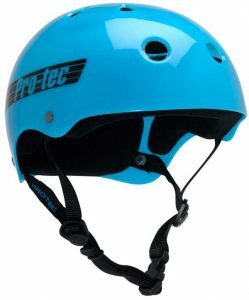 The best part of this product is the expertise and experience of the Pro-Tec brand. It is a brand that has been established in its industry for a while, this makes it a winner. The brand has been around for 40 years and have seriously loyal fans in the active sports industry, both professionals and nonprofessionals. -It has 11 large vents which is great for reducing damp and odour and also to keep the wearer cool. –Inner material consists of a 2-stage foam liner, not styrofoam, this makes it very comfortable to wear. -Comes with a 1 year guarantee, customers can buy with confidence. Foam padding might be softer and more comfortable, but EPS is what the law states is safer. This means anyone under 18 wearing this helmet might be breaking the law, depending on what state they live in. The best thing about this helmet, apart from its value for money, is that it was designed for kids from ages 2 and up. It is perfect for little heads and available in many bright colours that kids are certainly going to find exciting. The outer shell is made of strong ABS plastic (Acrylonitrile Butadiene Styrene) and the inner part of the helmet is padded with soft foam. A very good feature of this helmet is the retention dial fitting system which allows a custom fitting to the wearer’s head. -The fitting can be customised to the wearer. -Suitable for biking, rollerblading , scooters and the other outdoor activities kids love. -Amazing value for money, very much affordable. As far as quality, well designed helmets go, this one would be a major qualifier. The visor is an unusual feature for skateboarding helmets, that’s one of the reasons The Watts helmet stands out. 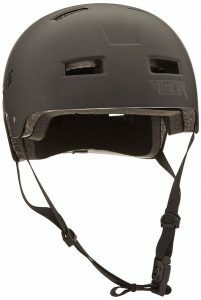 -It Can be used all year round: in summer for skateboarding and in winter for skis and snowboarding, you are literally getting two helmets for the price of one. – It has been designed with a visor to keep light rain or snow away from your face, a very good way to keep you focused on the activity being carried out. – It’s been designed to include a drop in audio ready ear flaps which allows you to listen to music during your activity, (Audio sold separately), relieving you of the need to always have your music player devices or phones with you. – Outer shell is made of ABS with EPS Foam, ready to absorb really strong impacts..
– It has multiple certifications, making it a multipurpose helmet. -It features a crank fit dial which can provide customized fitting for the wearer. -The components that make the helmet even more amazing do not come with the helmet, customers are expected to pay extra for them to fully enjoy the benefits of this helmet. -Amazon customers have complained about unusually smaller sizes, where even a 3XL might have proven too small for some. This is something to watch out for. It is better to make the extra effort to take your own measurements rather than relying on general shop sizes. This is a triple certified skateboard helmet which means it’s also great for bikes and with its built-in Bluetooth speakers, you also get seamless audio integration for your music and phone calls. Who needs an earphone, when you have a Vigor helmet. This helmet is all technology, it is rechargeable and comes with a USB cable for recharging it using most common outlets. -It passes all safety regulations and certifications. -Multi certified so it can be used for more than just skateboarding and also to prove it has passed the “multiple impact test”. This means you are provided with maximum protection should there be a crash. -You can enjoy privacy when making your phone calls, thanks to the intimate and discreet nature of its in-built bluetooth speakers. -Wireless connections makes holding your phones an unnecessary task. -Your music playlists and audiobooks are ready to be enjoyed without the fuss of interrupting your activity to scroll through your devices. -The helmet’s integrated audio helps you get GPS navigation straight into your ears while your phone is safely tucked away from damage and theft. -Although the in-built Bluetooth speakers are located behind the ears to ensure that you can still hear what is going on around you, it can still be a distraction should the music or audiobook be too loud. -On the flip side, perhaps the outside noise may also interfere too much with audio, reducing its benefits. A unique helmet that encourages creativity and imagination. It was created to be drawn on for customization and also to be wiped off easily, this way your helmet can match your personality, your bike, your clothes and your mood, almost like DIY. You can literally have a new helmet everyday of the week, if you wanted it so. The ink is scratch-proof and waterproof so it stays put for as long as you want it to. The ink can be cleaned using the included cleaning solution to erase your design and then you can start afresh to create something else, doing the whole process all over again. 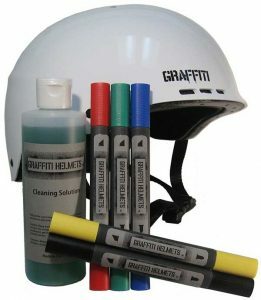 When you make your purchase, you receive a kit which includes a helmet, five markers in red, yellow, blue, green and black colors. You also get a cleaning solution, scouring pads, and an instruction manual on how to use the helmet. -It is CPSC certified, meaning, it can be worn legally in skateparks in USA. -Appropriate for kids and adults, creative families can get the thrill of a special family design. -Customizable features, so you can create a new design whenever you get tired of your current one. -It comes in a wide range of sizes for more fitting options. -Features a classic skater design which includes ventilation holes to keep its wearer cool and reduce the risks of damp and stale sweat smells. -Not ASTM certified, meaning it does not pass the ‘multiple impact test’ this may not be the safest helmet to buy. -Some Amazon customers have reported that the markers do not come off completely when wiped, faint traces of previous designs are usually left behind. -Markers are not sold separately, you have to contact the seller or manufacturer for instructions on how to get replacement markers, if there are any for sale. This is multi sporting helmet features a special aerodynamic design and was devised to resist tough impacts with its tough, hard-wearing shell and soft, padded lining. It uses multiple vents and breathable foam to reduce sweating and keep the wearer cool. It comes with straps that are easily adjusted to fit snugly around the head,without having to worry about it falling out. The helmet also uses extra cushion, in addition to its EPS liner, to provide added comfort to its wearer. Especially when being worn for a prolonged period of time. -A durable exterior PVC shell, best for absorbing and resisting impact or shock caused by a crash during outdoor sporting activities. -Well ventilated using multiple vents and lined with breathable foam, so dampness and odour from sweat will be the least of your worries. -It comes with adjustable straps for a good fitting. 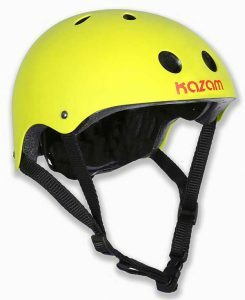 -Manufactured with a lightweight but strong and sturdy material to prevent the helmet from being bulky or clunky and reduce strain to the neck and head of the wearer, which can sometimes occur with heavier helmets. 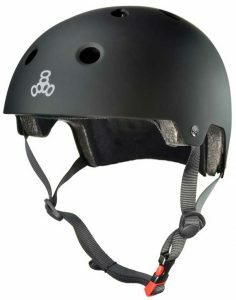 -A multi purpose helmet, it was created not just for skateboarders, but for many other outdoor sporting activities as well including bicycle riding, roller skating, inline skating, scooter, rollerblading, longboarding and two wheel electronic boarding. You only need one helmet, not several helmets per activity. -It comes in many colours, providing more options for fussier customers. -Its many uses covers a very wide range, it is perfect for stunt riders and stunt men. -Great helmet for the price, it is fully functional while being one of the cheapest on Amazon. -The website is a bit misleading as it claims on one part to be for adult and then also claim on another to be for kids. Amazon customers have complained about this issue too. -Despite the helmet manufacturer’s claims, a few Amazon customers have criticized the helmet for its very poor fitting and the straps not being sufficiently adjustable to make up for the poor fitting. Whatever brand of skateboarding helmet you decide to buy, make sure safety is the key factor behind your decision. Your budget also will help you narrow down your choice, but to avoid wasting time and money on returning the helmet, always make sure that you have taken your measurements the right way as advised earlier on.